"The border city of El Paso, Texas, used to have extremely high rates of violent crime — one of the highest in the country, and considered one of our nation's most dangerous cities," Trump said in his State of the Union address Tuesday. "Now, with a powerful barrier in place, El Paso is one of our safest cities." "The facts are clear. While it is true that El Paso is one of the safest cities in the nation, it has never been '...considered one of our Nation's most dangerous cities,'" the city's sheriff, Richard Wiles, an Democrat,said in a statement after Trump concluded his address. "And, El Paso was a safe city long before any wall was built." "The geography of Texas won't allow a fence from El Paso to Brownsville even if you wanted to do it," Margo said. Rep. Veronica Escobar, D-Texas, who represents El Paso, called the president's remarks about her district "troubling" in an interview on MSNBC's "Morning Joe" last week before writing Trump a letter asking him to apologize and correct the record. "El Paso is and always has been a safe community — one of the safest in the country," she told MSNBC. Escobar and former Rep. Beto O'Rourke, the Democrat who held the seat before her who is reportedly mulling a bid for president in 2020, will join an anti-wall march in the border city on Monday aimed to counter Trump's rally. When pressed on the inaccuracy of the president's claims, the White House said the high rate of crime in the city directly across the border — Juarez — proved that the barrier was responsible for the low crime rate in El Paso. "Well, just so you know, in Juarez, which is across the border in Mexico, the murder rate has gone up significantly. So the mere fact that you do have a physical barrier at that place as we [do], that does work and helps keep the crime out of El Paso because the crime rate has increased Juarez," White House director for Strategic Communications Mercedes Schlapp told reporters last Wednesday. El Paso does currently enjoy a relatively low rate of crime: There were 19 murders and 1,819 aggravated assaults in the city in 2017, according to FBI crime data. The city's murder rate is about half that of the national average, and a fraction of more dangerous cities. In the similarly sized city of Detroit, there were 267 murders and 10,193 aggravated assaults, for instance. 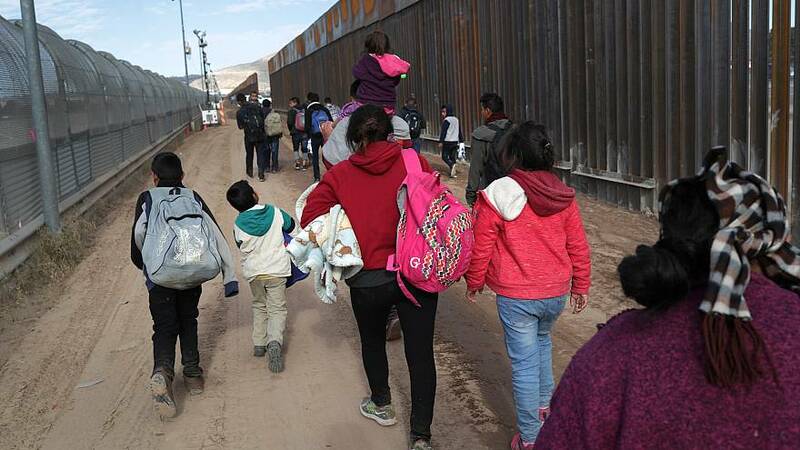 "I've been here for 30 years now and before the wall, after the wall, it's always been a safe town," Western District of Texas Federal Public Defender Maureen Francotold NBC News. "There are many times that people will still not lock their doors because of the perception and reality that it's a safe to live here." What drove down crime, if it wasn't a border wall? Big changes to border security did help El Paso — it just wasn't the fence Trump is now hailing. Operation "Hold the Line" stationed 400 Border Patrol agents across the border and implemented new technologies, putting a show of force along the border that effectively sealed a porous border. "It had no effect on us whatsoever other than it diminished the natural beauty" of El Paso, she said. "It didn't require a wall." Reyes, a Democrat, was later elected to represent the district in Congress. He served for 15 years until O'Rourke, now a potential 2020 contender, unseated him in the 2012 primary. Last week, in an interview with NBC's El Paso affiliate KTSM, Reyes acknowledged that the border has changed significantly since he was running the El Paso sector, but said he disagrees with the president's calls for a border wall. "There are better ways of doing it than putting up the president's proposal," Reyes said in the interview. Reyes, 74, said technology and manpower are still the best way to police the border. "Anyone who says this border is in crisis doesn't know what they're talking about."